A recent installation of Silvelox garage doors Cheshire. We are designing a house for a client in Hale, Cheshire and require a garage door. The house is a complete new build and is of contemporary design. The front door is oak and there is also oak cladding on the house in the same ‘random’ width board style. The garage door needs to match this as closely as possible. The garage on this property is integral to the house so security is important as is insulation due to a bedroom being above. The house is of high specification so the door will need to be automated. Although this brief may sound fairly simple oak garage doors are not readily available. This is because oak is not the ideal material for making garage doors from due to its weight and the amount of movement in the timber. 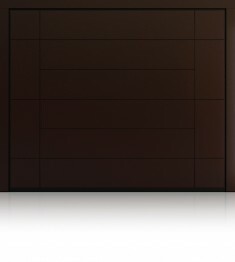 More about oak garage doors. 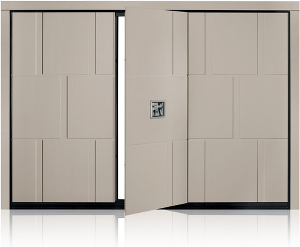 Silvelox are an Italian manufacturer that specialise in timber garage doors. 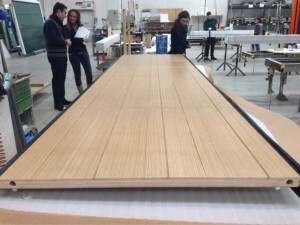 Silvelox garage doors are made from okoume hardwood panels. These panels are made from layers of okoume which are layered in opposing directions and bonded together to create an extremely stable panel which will not warp or shrink in the way solid timber can. Different timbers including oak in the case of this project can then be veneered on to the top level of the okoume panel. The benefit of this Silvelox garage door is the look of a solid oak door but with the increased strength and stability of an engineered board. The product chosen was the Silvelox Overlap. The Overlap is a relatively new type of garage door called a trackless sectional garage door which has been invented by Silvelox. The okoume panels described above make up a door leaf thickness of 75mm which gives a U value of U=1.0W/m2k making Overlap the best insulating domestic garage door available. Overlap comes as standard with automation which is neatly integrated in to the head rail of the door frame. More about Silvelox Overlap. With most garage door manufactures there is a range of pre-designed doors to select from and whilst bespoke sizing may be available generally bespoke design is not. With Silvelox bespoke design is part and parcel of what they do. Whilst there is of course a range of pre-designed styles it is only a relatively small supplement to go bespoke. 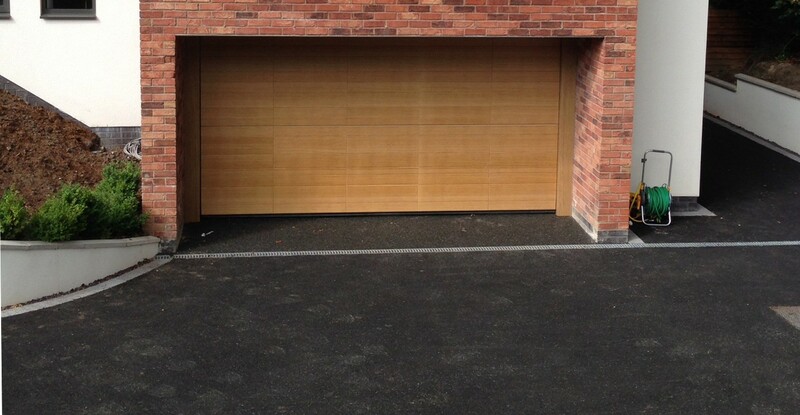 The ‘random’ width board style of the garage door was designed by Cheshire architects, The Cave who are based in Alderley Edge. We worked with Silvelox to produce an approval drawing and once signed off the door was put into production. Whilst on a visit to the Silvelox factory in Italy we actually saw this door in production which you can see in the image to the right. We installed the door on to steel posts which were then clad with matching oak boards provided by Silvelox to make the whole thing look like solid timber. As well as the Silvelox door you see here we supply all different types, makes and models of garage door in and around the Cheshire county. 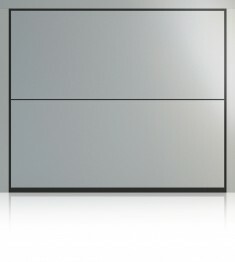 Silvelox garage doors are also available with matching front doors.